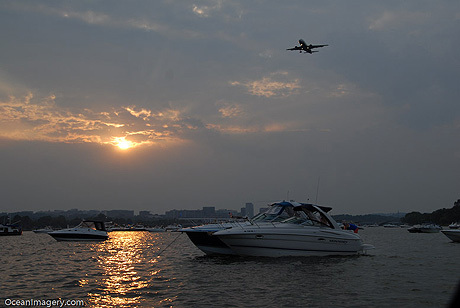 When I was younger I use to boat on the Potomac River almost every weekend during the summers. It wasn’t until several years ago when I reconnected with a good friend of mine from high school that I realized how much I truly missed having a boat of my own. Chris and I started hanging out again after catching up at our 20 year reunion in 2004. I didn’t know it at the time, but he was really into power boating and takes his wife and kids out on the Potomac just about every chance he gets. He invited me out a couple of times and low and behold it has become a weekend habit again (when time permits of course). I find it truly relaxing to be on the water no matter where it is and boating has always been in my blood, so when he invited Julie and myself to go out for the Fourth Of July I couldn’t say no!! I decided to bring my camera along and see what kind of photos I could get from a rocking boat in the middle of the night… take a look, you might be surprised at how well they turned out… ;-)! !